Foreigners have to go through a lot before putting their hands and officially have their name on a contract that attest a property ownership in Indonesia. They have been for a long time unable to own land or any type of property, Things start changing, fortunately. In the late 90s, new laws were enacted so that foreigners are permitted to purchase apartments and office space in Indonesia IF the building has a strata title status. This enables the foreigner to own the apartment or office space but not the land on which it stands. 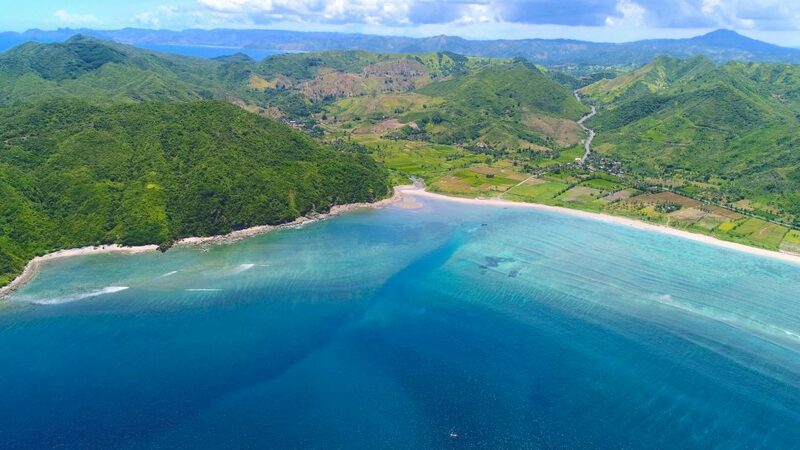 For many years Indonesia has decreed that land in Indonesia can only be owned by Indonesian citizens. Thus, if you want to buy a house (as a foreigner), this would have been legally impossible. Further laws were passed in 2010 & 2015 which may make it easier for expats to hold 80-year leases on land, but the particulars/interpretation/implementation of the law isn’t always clear. Indonesian Agrarian Law, Law No. 5 of 1960, governs the property ownership in Indonesia in regards to lands. In it is a category of land ownership called “Hak Pakai” which mean the right to build on/use the land. As stated in this law, foreigners are only permitted to purchase land or homes under the “Right to Use” (Hak Pakai) title. 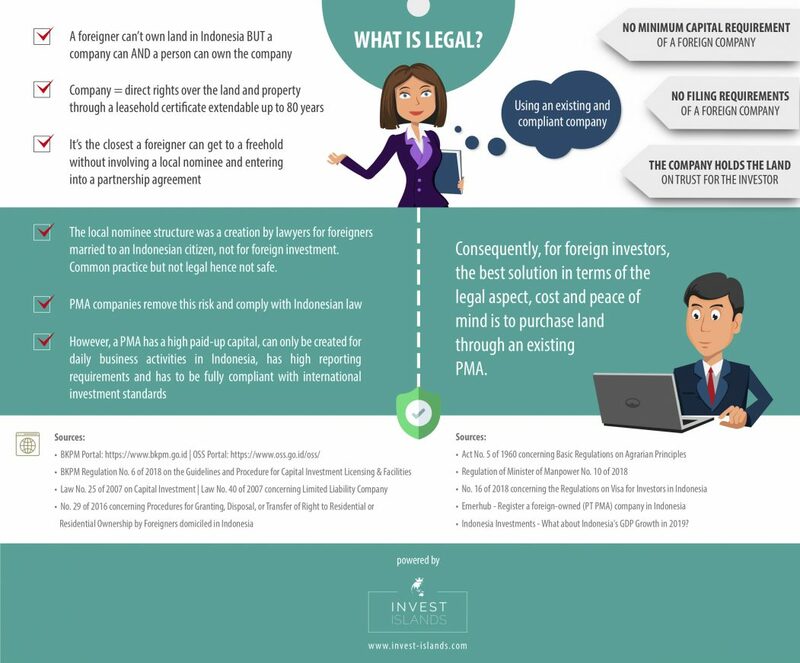 The legal entity through which a foreign person, foreign company, or foreign government body can obtain the property ownership in Indonesia (meaning generating revenue streams and profit) is the PT PMA. The establishment of a PT PMA is regulated by Law No. 40/2007 regarding Limited Liability Companies (Company Law). 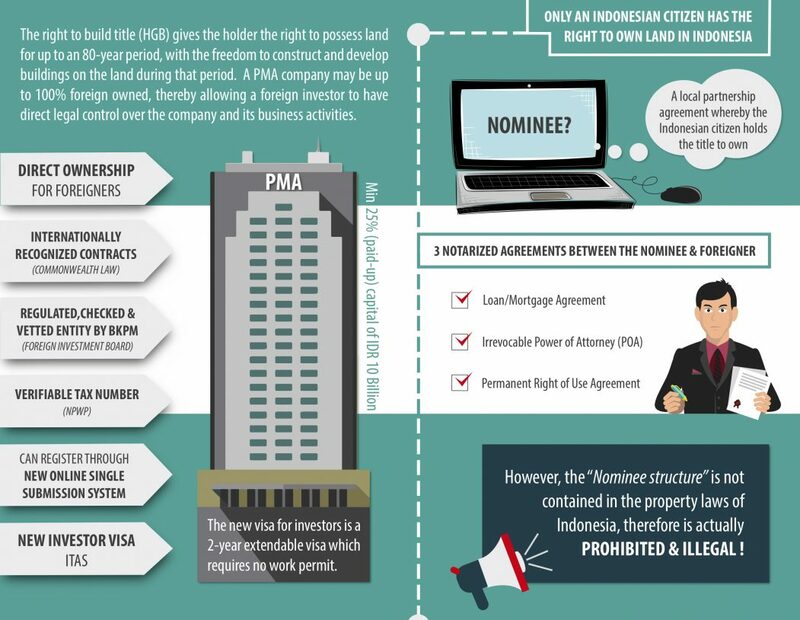 Since foreigners are not allowed to own freehold property in Indonesia, the same restriction applies to PMAs. However, total control and title of the property by the PMA are secured by changing the property ownership right from “Hak Milik” to “HGB” (“Hak Guna Bangunana”). HGB can later easily be converted back to Hak Milik, for example, if the property is sold to an Indonesian or if the foreign investor decides to use the Nominee method. Another way that you can purchase a condo is by paying for the property but putting the title in the name of an Indonesian citizen. Needless to say, this must be someone you trust implicitly since, according to the law, this person would be the legal owner, no matter what verbal or written agreement that you may have between the two of you. Most lawyers will advise that you should NOT do this as again you do not have any “legal” document that says the property is yours. You are REALLY putting yourself in a vulnerable position. We’ve heard many stories of people who have lost major investments by trusting an Indonesian “friend” with holding the title to their purchased property. 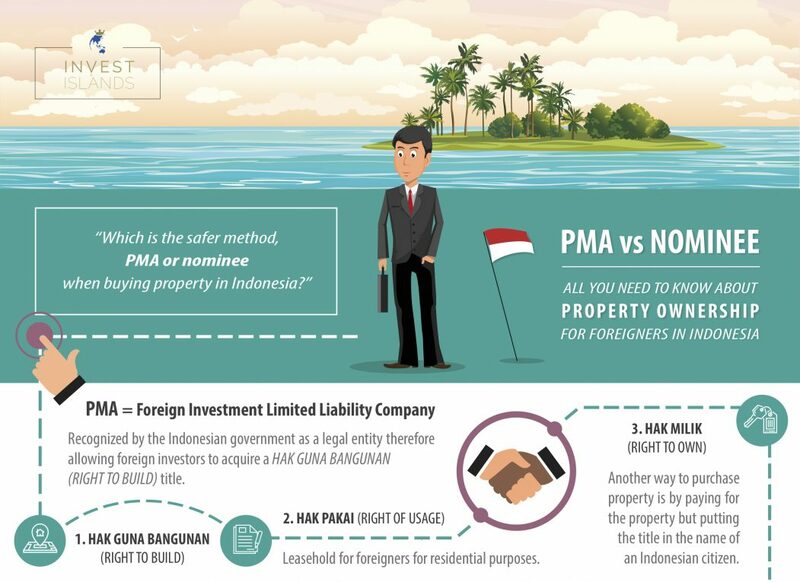 Using a nominee to shelter foreign ownership of property is actually illegal in Indonesia. If investigated and pursued, the government could seize the land and the ownership would revert back to the state. Hak Guna Bangunan is only the right to use a building for a certain period of time and then has to be extended. The owner of HGB land is the Indonesian government. HGB is also translated as – Conditional Corporate Ownership. Only with Hak Milik do you actually own the land or building. Hak Milik does not need to be extended. Hak Pakai allows you the use of the facilities, but not the ownership. Hak Pakai is also translated as – Conditional Ownership. The Indonesian banks will NOT lend money to property owners that only have Hak Pakai status for their property. The land title MUST be Hak Milik in order for the bank to use the title as collateral. Therefore, expats have traditionally not been able to get loans to purchase property in Indonesia, because they cannot have Hak Milik titles. This applies to everyone….even Indonesians. The normal length on house loans in Indonesia is five years, not 20-30 years as it is in the west. The Indonesian banks will NOT lend money to property owners that only have Hak Pakai status for their property. Property Ownership In Indonesia | What Therefore Is The Solution For Foreign Investors? The best solution for foreign investors in terms of legal aspect, cost and peace of mind, is purchasing a land that belongs to an existing PMA ensuring that a binding contract between the PMA and an Individual investor is in place in order to specify amounts, duration of investment hold, security of investment etc. If the buyers decide to sign Notarized documents to enter into a lease with the PMA, this structure will even allow them to fully own, develop and control the property within the lawful term of HGB. It also allows them to sell any interest in the property offshore if they want to do so. Lease agreements will be registered directly in the buyer’s name without the need of an Indonesian nominee. Before jumping into this messy burocracy better be prepared then!